President Obama has signed an agreement with President Karzai to keep a major U.S. military presence in Afghanistan (currently about three times the size Obama began with) through the end of 2014, and to allow a significant unspecified presence beyond that date, with no end date stipulated. Obama stresses that no permanent U.S. bases will be involved, but his agreement requires Afghanistan to let U.S. troops use "Afghan" bases. For two weeks after the March 11, 2012 Afghan massacre, its 17 dead victims and several wounded were anonymous to the world. Americans read daily about their alleged killer, Staff Sergeant Robert Bales, his multiple deployments, his wife's worries, her pregnancies—even in the few days before we learned his name. At the end of March, Afghan born Australian journalist Yalda Hakim found her way to the villages where the massacres took place. The Afghan Army working with the U.S. military was reluctant to let her in. She prevailed. Report by the Australian TV Show Dateline; appeared March 27, 2012. Communities in Oakland have been struggling against police violence, surveillance, criminalization, and incarceration for generations. Police here are becoming more and more militarized daily, there are joint trainings between local police, the US military, IDF, and Bahrainy security forces. Soldiers, trained killers returning from war, are joining the local police forces. Local police departments are investing in and using military grade weapons for low intensity warfare upon civilians here. We experienced the raids and night raids here in Oakland. We saw people get beat the hell out of, got shot by rubber bullets, bean bags and tear gas canisters. Now imagine that becoming live rounds, grenades and bombs. The death of innocent civilians is nothing new in Afghanistan, but these 16 victims, nine of whom were children, were allegedly murdered by a rogue soldier, rather than the usual killers – drone attacks, air strikes and stray bullets. This incident has elicited rage among Afghans and westerners alike. But why are westerners not equally outraged when drone attacks kill entire families?US army soldiers in Panjwai district, Kandahar province, southern Afghanistan, where American troops have been fighing since 2001. The problem begins with the depravity of the U.S. military in its mission, its training and its purpose. ‘Are our soldiers seeing too much combat?’ as one retired military general asked after the most recent Afghan massacre of 16 civilians. How much combat – organized and spontaneous killing, destruction – is too much? 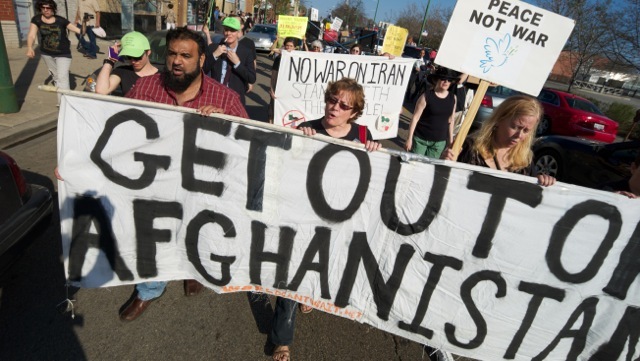 Enough so that US killing in Afghanistan is just short of being caught massacring civilians? Enough so that anyone any soldier considers a threat for any reason can still be killed just in case they might pose a danger? By now Americans are used to such reports, most turning the other way either because they don’t care or because they feel impotent to make change, both reasons leaving the US military virtually untouched while one investigation and court judgment after another exonerates the murders. It is a quiet night in the village of Panjwai, Kandahar. Children are sleeping next to their mothers in simple mud homes. The quiet night is disturbed by a sudden loud explosion. A terrorist has entered one of the homes. He sprays a rain of bullets on the unsuspecting children and mother. He is on a killing rampage, as his bullets splatter the children’s blood on the walls and floor. He does not even spare the two year old clinging on to his mother for dear life. He then proceeds to burning the deceased bodies by pouring chemicals on them. This terrorist does not wear a black turban on his head nor a beard on his face. Instead he wears US military fatigues with the American flag sewn next to his US staff sergeant badge. Malalai Joya is a courageous voice in one of the most difficult places to live in the world. The youngest person to ever be elected to the Parliament of Afghanistan, she has dedicated her life to ending the rule of warlords and war criminals and the U.S. Occupation that props them up. She has survived 5 assassination attempts as she continues to speak out about the the real enemies of peace in her country. In this KBOO exclusive interview Ms. Joya addresses a wide range of issues, from the living conditions faced by the average Afghan, the Talibanization of the Afghan Government, conditions face by women today and much more! The anger provoked by the U.S. soldier’s attack on 16 Afghan civilians comes amidst outrage over civilian deaths from U.S. drone strikes and a growing humanitarian crisis in Afghanistan. Hundreds of Afghan children die daily from hunger even as the United States spends some $2 billion a month on maintaining its occupation. We speak with Kathy Kelly, co-coordinator of Voices for Creative Nonviolence, who has just returned from Afghanistan to stand trial for her role in a protest at a U.S. base over the use of drones. "When is the United States going to understand the rage and the antagonism felt by civilians who have borne year after year after year of attacks — unprovoked and uncaused attacks against civilians — as the United States has used its occupation to try to dictate the future of people in Afghanistan?" Kelly asks.